In previous posts I’ve made reference to the poisonous comments and allegations made by anonymous individuals on this blog. While some have been directed against Lutfur Rahman, the target of most has been Helal Abbas. Those levelled against Lutfur have been dealt with elsewhere and denied (or not, as the case may be) by the man himself. Until now, I’d decided not to repeat possibly the most outrageous of the lot. But a non-event tonight has helped me change my mind. And I also have Abbas’s permission to publish it. Last week, this leaflet was handed out by supporters of Lutfur Rahman around the borough. It was also published as a page 8 advert in the current disgraceful edition of the London Bangla newspaper, which I posted about here last week. 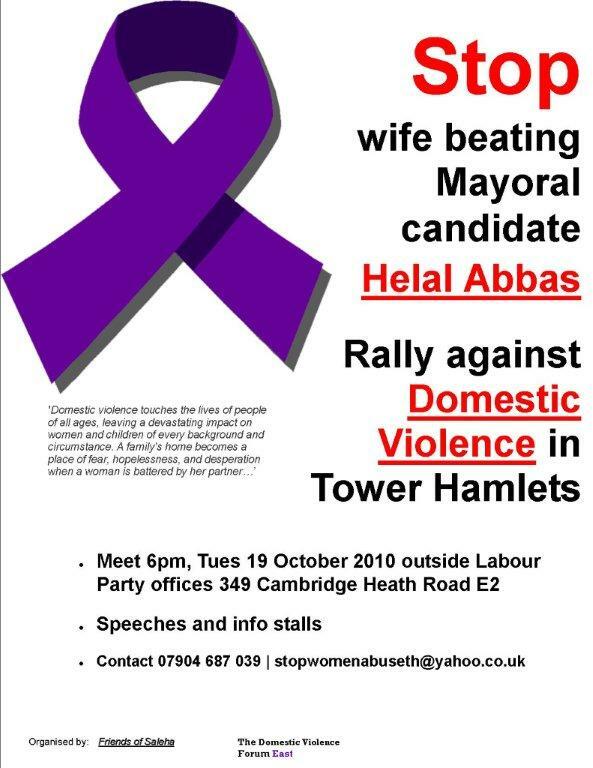 As you can see it alleges that Helal Abbas beat his former wife and that there would be a rally tonight outside Labour’s office in Bethnal Green to protest against domestic violence. The advert also provided a mobile number and said the organisers were a group going by the name of Domestic Violence Forum East. Every time I tried the number, the phone was switched off. When I called Tower Hamlets council’s domestic violence support officers, they were aghast. They do have a forum, but it’s not called Domestic Violence Forum East. They’ve never heard of this supposed outfit. They were also furious that someone seemed to be passing themselves off as one. More on that later. Abbas’s first marriage broke up a couple of decades ago. His ex-wife lives in Manchester and they have a 22-year-old son who I understand is at university. I also understand that Abbas met his ex-wife and son for lunch during the Labour party conference three weeks ago. I’m told that they get on well, that their divorce was amicable and that their relationship failed because, like many others, they married too young. As for the allegations/smears, Abbas tells me he “totally and entirely” denies them. I went along to see the demo at 6pm tonight, but guess what? Not only were there no speeches and “info stalls” being run by those dedicated to tackling domestic violence, but also there was not a single protester. It was all a despicable charade. When these leaflets first appeared last week, I texted Lutfur Rahman and his aide, Cllr Oli Rahman, to ask whether they endorsed or condemned their content. Neither has replied. He has also found an ally on this issue in Cllr Peter Golds, the leader of the town hall’s Tory group. In fact, to his vast credit, Peter, who has been subject to homophobic and anti-Semitic abuse in this borough, seems to be sticking out his neck far more than his Labour opponents in fighting the thuggish elements of Tower Hamlets politics. Last week, he wrote to Ofcom to complain about the biased coverage and possible breach of broadcasting laws by the Bangla TV and Channel S satellite stations. Today, he wrote to the Press Complaints Commission to report his concern over the London Bangla newspaper, which some observers also think could have breached election law. He copied his letter to Tower Hamlets Returning Officer Kevan Collins and Paul Ricketts, the Met Police’s Borough Commander. Importantly, he makes the point that genuine victims of domestic violence could have been misled by the London Bangla advert into believing that forum and that phone number were genuine. The Advertising Standards Authority would also, no doubt, have a view. The Labour party selection process was controversial and as a result there is an official Labour candidate, Cllr Helal Abbas and an Independent candidate, Cllr Lutfur Rahman, who had been selected as Labour candidate but was deselected by the national executive of the party. This is an internal matter for the Labour Party and the 1,600 or so local members. However, it has exploded into the campaign and has become the dominant issue amongst a vociferous section of the Bengali community. Bangla News is a free newspaper, targeted at Bengali residents and published on a Friday. It is usually found in shops and Mosques. As a private paper it is fully entitled to an editorial stand and also the freedom to endorse whichever candidate in an election it wishes. However, it’s coverage of the Tower Mayoral election goes beyond anything that a responsible newspaper would normally do. The coverage is wholly slanted towards the candidature of Cllr Rahman and the paper repeatedly makes unsubstantiated slurs and allegations about Cllr Abbas. The three other candidates representing the Conservative, Green and Liberal Democrat parties are ignored. On page eight, the paper publishes an advertisement, purporting to be from the “Domestic Violence Forum East”. It makes extraordinary allegations regarding a candidate. It gives a (mobile) contact number and a yahoo email. The Domestic Violence Forum is a much respected nationwide organisation. It has a proper email address and maintains confidential helplines. There is no Domestic Violence Forum East. This advertisement is a fraud and usurps the name and credence of a responsible and important organisation for pseudo electoral advantage. No credible newspaper would have accepted or published such an advertisement. Furthermore what would happen if someone who was subject to violence used this (usually unanswered) telephone number or email address? What kind of advice or assistance could or would be offered. Certainly it there is no indication of a proper counsellor with back up. To make matters worse this paper has been, for the first time ever, hand delivered to addresses across the borough. Hand delivered so subtly, that non Bangladeshi residents appear to have been targeted. This paper is totally is completely irresponsible and this issue is a public scandal. I believe that a full enquiry is required. I attach a copy of the paper for your consideration. Helal Abbas’ campaign should seriously think of taking an injunction against this leaflet under section 106(3) of the Representation of the People Act 1983. You’re right David – but what would that achive by tomorrow? It would establish that the allegations in the leaflet were false. It’s not a leaflet – it’s an advert in a free local newspaper. There should be a fierce reckoning when this is over. Truly shameful. I am speechless with disgust that this incident has happened. I am a firm believer of woman’s rights and for anyone to play with peoples emotions is wrong on so many levels. on how great Swan Housing is, when everyone who lives on the exmouth estate knows Swan Housing is a rubbish Landlord. Shouldn’t the allegations be taken by Abbas into a libel case rather than Peter Golds writing in support of Abbas? Sounds like Peter Gold is doing the same as Ken, supporting a non-party candidate. I wonder how the Tory candidate feels of Peter Gold’s indirect support for Abbas? First of all lets get things into perspective, CAN you evidence that it came from Lutfurs team or are we speculation AGAIN. I find it hard that Abbas has some sort of elapsed memory when he is detroying other people’s character but all of the sudden he cries wolf?.. What also strikes me is the fact that Cllr Golds has never bothered to campaign for his own candidate but always taking the side of Abbas which shows you even the Tories know they wont be going far. Why does Peter Golds have so much interest in this issue, other parties like Lib dems or Green havnt spoken about it? Abbas is capable to defend himself, he does not NEED Tories to help him. But this next part for me really was too much to deal with, namely, the sheer hypocracy within the statemet…. Are you really serious??? Ted, even you can do better reporting than that. Yes. A colleague of mine received a text from a Luthfur supporting female Bengali councillor three weeks ago alleging that Abbas was a wife beater and a racist. At least one of the Lutfur supporters outside the meeting at Cambridge Heath Rd the night Abbas’ candidacy was confirmed repeatedly called him a wife beater. How do you know it has come from Lutfur’s team. Can someone please tell me why is PG complaining and NOT CLLR ABBAS OR HIS AGENT? PG seem more busy with Labour’s candidate than his own paty’s candidate. Why don’t you talk about BLACK MAIL that has come out in support of ABBAS? I WONDER IF THIS PAPER WILL STILL COME OUT AFTER THE ELECTION? Whomever is behind this disgusting campaign and whomever is responsible, even partly, for developing the idea, making up the ‘ghost organisations’ stipulated upon the advert, and party to it’s design and distribution is sick! Both as a councillor and having worked in social services for over a decade previously, I have first hand experience of genuine victims of violence and abuse. To encourage such victims to assume a false misrepresentation of a high profile public figure, especially when he is seeking votes during such an election, is way beyond the boundaries of acceptance. Quiet rightly as PG asserts, this leaflet also makes vulnerable, genuine victims that may collate the courage to make that call for help, but to no avail. This advert and it’s source, together with those who have promoted it through their respective media streams should be thoroughly investigated by the police because this type of disgusting actions cannot be allowed to to go unexplained. I am surprised that the Bangla TV channels that seem to give attentive coverage did not even bother to make an appearance at the ‘demo’? Surely one would have expected them to report this? How did they know nothing would really be happening? They have conveniently decided not to promote this episode, most obviously because it does not seek to damage the Labour party candidate they are most obviously biased against to date. They should be ashamed of themselves. on October 20, 2010 at 10:41 am What_about_Abbas's_Past? He had to be forcibily stopped from hitting a woman? So what is Abbas’s explanation on this matte? Christine and the woman concerned (who is getting on a bit) are incorrect. I remember the incident well. It involved someone other than abbas. That comments been on Shawcroft’s website for weeks. Surely Abbas would have seen it and done a libel on Helal Abbas. Of course he wont if there is truth to it? sorry meant libel on Shawcroft! Not on himself! I wonder who paid for the advert? That will start to identify who’s responsible. And if it was free then that will surely breach the law on electoral campaigning literature. It is utterly despicable and I hope to god that once the election is done there is a full investigation and that heads roll. I can’t wait till tomorrow although somehow I don’t think this will be finished even then. You only need to see few back issues of London Bangla and then you will get the idea who they are working for. See the links also on the facebook, that is also an indication of who do they support. Supporting a candidate is not a crime. After all this is a democracy, but breaking law in support of your candidate is something else. Unfortunately, you can only see the cover images, not the whole paper. MrStepneyRocker is posting the same false claims all over the internet. The videos he claims are fraudulent are in fact PHOTOGRAPHS of the Exmouth Estate. PHOTOGRAPHS posted by someone who is clearly happy with Swan. MrStepneyRocker is clearly unhappy with Swan and falsely claims “the majority of residents are unhappy”. Please, MrStepneyRocker, present proof of why you beleive the PHOTOGRAPHS are fraudulent. Also, please present proof of why you believe “the majority of residents are unhappy”. We have asked several times but you decline to show evidence. Why is that? You and a small vocal minority are claiming to speak for all residents of The Exmouth Estate. We have a democratically elected board. They speak for us. You don’t. The truth is in the middle here. You both should do some canvassing on other estates and you may notice Exmouth Estate is not the worst in Tower Hamlets but to say Swan is a good landlord? What is your connection to the residents board-clique Dan? Swan runs the residents board and when people try to speak up things are made as difficult as possible so people get tired and go back to normal business so you don’t actually hear the majority of people speak. Furthermore most people rather have other people speak for them, because of health issues, language, work and family commitments, confidence so ideal grounds for a clique which can hardly be called representative of the estate. I think it would be better if the residents board is removed and instead be a monthly Swan residents interests meeting, where any resident can join the meeting, raise issues. No members, no voting, no chance of jay-saying in return for favours or people championing their own interests during the meeting (just read past minutes). Plus a set agenda with published minutes within a week of the meeting where every resident can track action points. The fact that the Exmouth does not have a meeting like this but prefers to give an unrepresentative meeting credibility says something about the moral hazard RSLs pose. Who is responsible for this mess? The photos are not fake, but the comments are disingenuous and contrite and know they are. The estate was better off with LBTH. You seem to be in love with Swan Housing or are getting paid by them. Good observation Iloteme , and suggestion is perfect. It’s a shame that politics in Tower Hamlets has to be so poisonous. That’s why so many voters are put off by it. The first reference was aimed at Dan aka Lad from exmouth estate, and not to Iloteme who is spot on in his comments. Yes the exmouth estate is looking better, but it should look better Swan claim to have invested £18mil. Is it value for money- NO. I hope whoever wins the LBTH Mayor election actually keeps these rogue social landlords in check. MrStepneyRocker once again refuses (or can’t?) back up his statements, his own words when asked to do so, and instead responds with personal insults (“getting paid”). MrStepneyRocker claims videos of the Exmouth Estate posted are fraudulent when, in fact, they are simply PHOTOGRAPHS of the Exmouth Estate posted by someone who is clearly happy with Swan. In other words, someone who had the temerity to disagree with MrStepneyRocker . So please MrStepneyRocker tell us how these PHOTOGRAPHS are “fraudulent”? Those were your exact words. I’ve looked and I can’t tell. I live on Exmouth and all I see are PHOTOGRAPHS. MrStepneyRocker further claims â��the majority of residents are unhappyâ�� with Swan. Once again MrStepneyRocker, please present proof supporting your (false?) claim that â��the majority of residents are unhappyâ��. We have asked several times but you decline to show evidence and instead lash out with personal insults (“getting paid”). Why is that? Of course it isn’t because you are making things up, is it? You’re not telling fibs are you? You can provide proof for all your statements, can’t you? We suspect you can’t. Finally you should become better informed regarding the political landscape and process in Tower Hamlets; the Mayor (yeh Lutfur!) won’t have control over planning (which you won’t like and we both know why), the Council will retain that power throughout the Labour dominated planning committee. And keeping rogue social landlords in check? Where have I heard that before? Its not your phrase at all MrStepneyRocker. No, that Canadian guy who gave speeches at LBTH four times in 2008/9 did more than anyone else, yourself included, to rectify the situation on The Exmouth Estate. He went to LBTH four times, full council, named and shamed and generally pushed stuff along. Met all LBTH councillors one on one, held public meetings on the estate, chaired them himself, put his name forward. You can google his name up, it was in several newspapers ELA, Daily Mail, Guardian don’t know where else. He didn’t hide behind an internet psuedonymn when making his charges MrStepneyRocker / mamakupucho / third psuedonymn omitted. He put his real, legal name forward and we thank him for all his hard work. Things aren’t perfect now (never are) but are much better. Oh and yes, we know and most people on Exmouth know who is really behind all of these false charges you are making all over the internet and why. Greed, like false statements, is a terrible thing. A lot of people dislike George Galloway in Tower Hamlets, although he was right to criticise Swan Housing for poor management. I agree with him if the Exmouth Estate had a choice to return to council management the majority would vote yes. Residents were conned into stock transfer. Many residents complaining on the link below.